I put together a variant to Red November that adds different characters, each with different abilities. I was inspired by games like Last Night on Earth, Arkham Horror, and Shadows Over Camelot. Here are a few examples. Note: with the addition of these abilities, I suggest a rule change that a roll of 10 on a Fix-It Roll always fails, so no roll is ever certain. This makes the reroll mechanics that a number of characters get much more useful. The whole thing is available for download on my blog. I'd appreciate any feeback - I haven't had a chance to playtest this extensively enough for my tastes, so it's still very much an "as-is" kind of thing. Still, the players I've showed it to have enjoyed it. Wow ! Sounds great. May I post this on my website as a variant ? Yeah, go right ahead. Hope you enjoy it - I know I quite like the basic game. Thanks! But this game variant is simplier than mine "Perks!" variant. But as Journeyman GM said in his comment that some of those are unbalanced, mainly making the game much easier in my opinion. I like those "if you roll this you can keep the item" perks and Dugger's Tough Stuff almost so much that I'd like to put them in my rules too :3 But I'll do it only if you give me permission. Yeah, of course, feel free to put stuff from these characters in your perks. 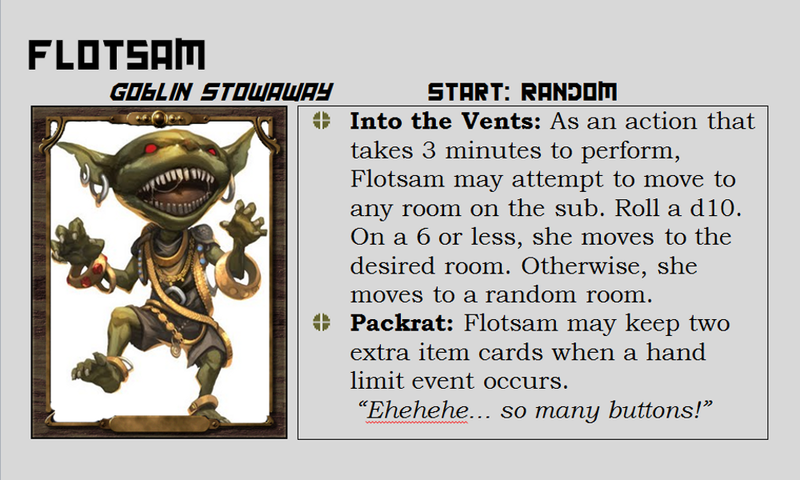 I saw that after I had already done most of the work on this, and went to the FFG forums to see if anyone had done anything similar. I liked 'em, but I prefer the idea of having a "character", like most other cooperative games, with a name and some flavor specific to each character. I'm a role-player at heart, so it just fits better for me. I can see what you guys are saying about it making the game easier, but that (surprisingly) hasn't been my experience. Initially, most of the characters had pretty serious drawbacks if they had a good power. However, what I experienced in the two playtests I did was that we lost both times. In the couple of times I had played the game previously, we won every time. This suggested to me that the characters were a little too flawed, so I scaled back on the flaws. It's entirely possible that this experience was just statistically unusual - I'm not sure what kind of odds Red November really has in terms of win/loss ratio if played well, having only played the game four times. 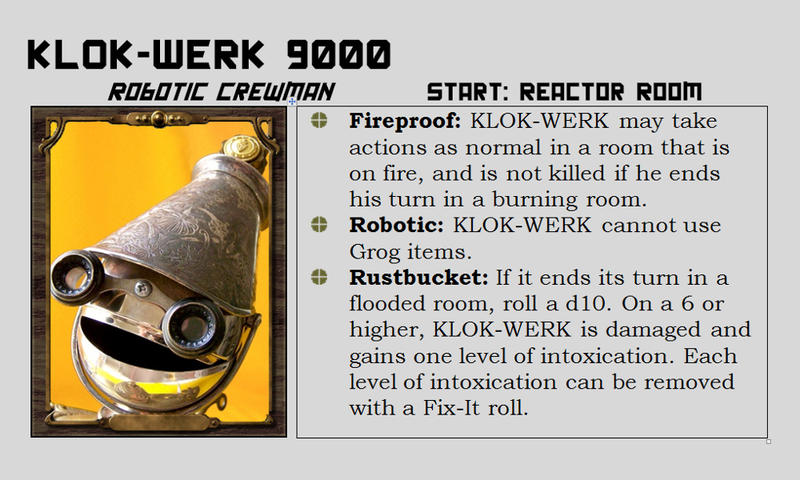 I talked about the idea of this variant the first time we played, and my gaming group expressed immediate interest, which is why I put this together after having not played the game too many times. In my initial draft of this variant, I said that you always failed on a fix-it roll on a 9 or a 10, rather than on a 10 (as it is in this version). I instituted that rule for two reasons - to make rerolls more important (as several characters had reroll abilities specific to a task) and to make the game more difficult to compensate for the additional powers making the game easier. The character's abilities were different in the first draft, too. 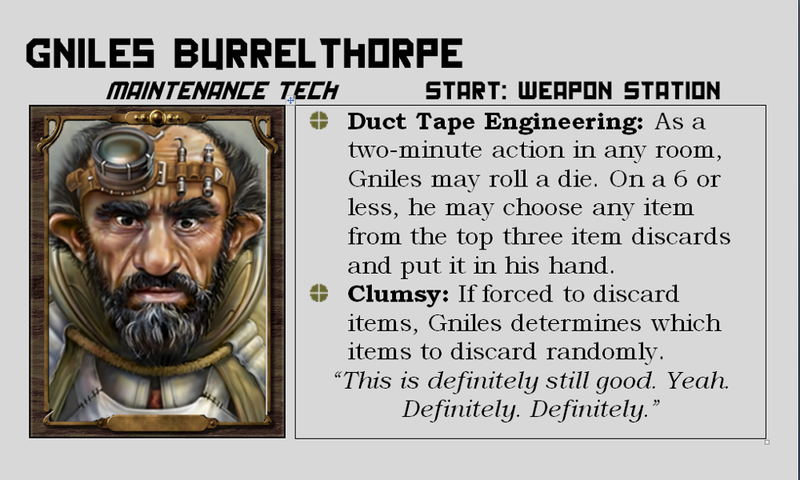 One or two characters had a flaw where bad things happened to them if they rolled a 10 on a fix-it roll - I think the chief engineer had to draw an event card if he rolled a ten, and the mechanic had to discard a random item. Something along those lines. 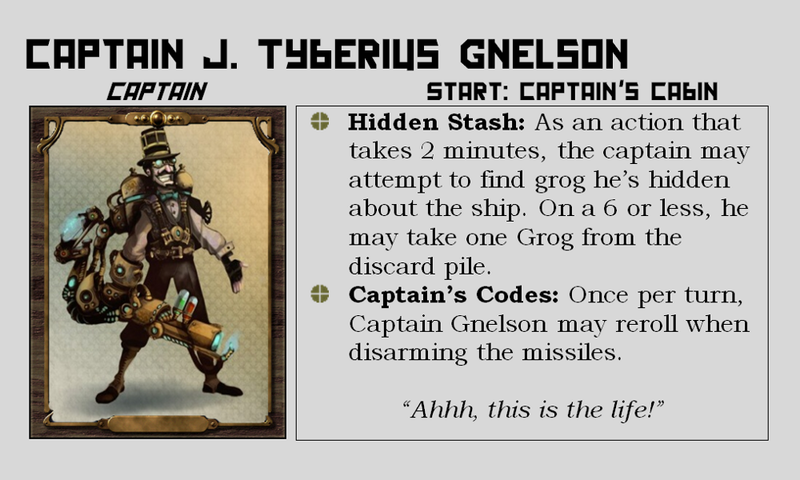 The captain had a mechanic to give people reroll tokens through inspiration, instead of his Hidden Stash power. The gadgeteer's power was to make a fix-it roll to draw a few cards from the top of the deck and pick one of them to go into her hand. Which abilities seem too powerful to you? Anything in particular? This "overpowered" thing actually went a quite downhill when I read the rule change. But Jacques' "Deep Breath" feels a bit useless since there isn't very much to do in the game outside of Red november. And I believe that Dr. Thaddeus' "Ship Shape" might be a bit confusing for some players. It's hard to me write why (afraid of Engrish) but to me this kinda brakes time continuum, since a gnome's time marker moves backwards. Or will those next 3 or 4 events happen in this gnome's update or is there "invisible Luck Token" for those?